Alright can I confess something up front? I'm not up totally by choice. I didn't really bust out of my warm comfy bed with an intense urge to blog in the middle of the night. 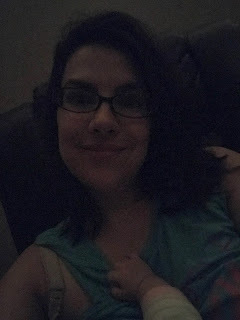 As you can see by the tiny arm in my creepy dimly lit picture, I'm up nursing my baby who just felt like it was the right time to get up. But while I was up, instead of being my normal drowsy self, my mind just starting going. What the heck is happening with my blog? I miss it! Kinda like an old friend you haven't touched base with in way too long. Anyway, maybe these nursing sessions might be a good time to check in on here. Think of it as an extension of the "random thoughts" I leave at the bottom of my video description boxes. Current thought... what are my viewers really wanting to see? I've been trying extra hard in my video brainstorming sessions to come up with ideas that I haven't seen done a hundred times already. I'm extra pumped about the stuff I'm posting this week. Including something extra fun coming Saturday. But then there's the question of length. Shorter? Longer? I think I need to mix that up. I just feel like I have this huge subscriber base and I want to reach you ALL with things that you want to see... but also not do things just for the sake of views, but because the ideas actually MEAN something to me, you know? Sir, thank you so much for you genuine spell,my lover is back!!! Hi Emily! I admire your determination to work even though you are so busy and (likely) exhausted. The reason I lover your channel is because it's relatable and not just shopping inducing of the latest and greatest...so for me I would like to see videos that make me want to use my current makeup collection. All the best and can't wait until Saturday!! your posted content is really very nice! Godaddy $1 Hosting and thank you very much for these best post. I need a list or video on blue red lipsticks!!!!! Definitely more "use what you have" videos! I loved the idea behind "eye remember" (did I remember the spelling?) and would love more thorwback videos using permanent palettes or items a lot of people already have but aren't as talked up these days! And I will be up with you in solidarity, soon, baby number 6 expected to join us in just over a month! Lol! We posted almost at the same time and asking for the same! YAY!!! You're back on the blog!!! I missed it so much too!! It's so good to have you back on the blogging community! I was just thinking yesterday about how much I missed your blog, and was so excited to see a new post this morning! I am also liking the "eye remember" videos, and would love to see that expanded to other "old favorites" makeup items (foundation, blush, lip) and brands (MAC, Milani, Estee Lauder, etc). When it comes to video length, the longer the better :) I always loved the format and length of your Beauty Broadcast Live streams. Your videos are my absolute favorite and I could watch them all day! I'm beyond impressed that you were able to write a blog in the middle of the night while nursing. My brain was always mush during those times and I could barely stay awake. I hope you have terrific day! Hi Emily! I agree with the ladies above on the Oldie but Goodie kind of videos! Lord knows I don't need to spend anymore money on makeup, but that's easier said than done :) Hope you were able to get some sleep in after your mid night nursing session! Lots of love to ya!! If I'm being honest, you could read the phone book and I'd probably be interested. I've been watching you for years, and I can honestly say you haven't posted a video I haven't enjoyed. My favorites are your GRWM videos where you just sit and chat about life and makeup while you get ready. I also really enjoy tutorials and product reviews. I too, would really love to see some more 'Shop My Stash', the 'Eye Remember' throwback palette tutorials. Being that I'm a new YouTuber, I also enjoy learning about your process--from idea to video fruition, and the behind the scenes stuff would be very appealing to me. Thanks for all you do. You rawk out loud and you will remain my favorite YouTuber (and I watch a LOT) God bless you and yours! I am super impressed that you typed all this on your phone. I would have given up after the first paragraph. Can you please go back to the style with your "Emily awards" you had 2(?) years ago when you did best face products in high end and a drug store :primer, foundation, concealer, powder....etc So we can have choices for the "full face"/"primer to finishing spray" kit!? So glad you blogged about this! I too am a night time thinker while Im nursing. I do all kind of things on my phone in the middle of the night. Touch base on how your skin has changed since having your gorgeous little girls; what things have you changed in your routine whether skin care or make up routine. Thanks for all your fabulous videos and hard work! I have no idea how you manage while raising your little ladies. Hi Emily! I'd love too see tutorial for eye looks using one palette. I find it easier to just use one at a time but I'm often stumped on how to mix it up. I tend to use the same safe colors and don't always venture into all the colors in one palette. Love your YouTube channel the best! I like all of the ideas the ladies listed above. Also, you are wonderful. I love all the new types of videos that you have been putting out. Also, you are rocking this youtube and momming thing. Great job! I really enjoyed the "Makeup I've Changed My Mind About" video from 2 years ago, I'd love to see another if you've got items that fit in that category! Hurray for a blog post! I watch about 10 youtubers religiously and in my opinion you can tell about half just arent passionate about what their doing anymore! Your passion and excitement are what bring me back to your channel over and over again!!! People love reviews there really are so many new products and everytime i watch a review on essence or catrice or bh cosmetics or makeup revolution.... No one tests the products i would actually buy and its so aggravating!!!!!!!! Emily, I am a 23 year old makeup enthusiast who works in a professional setting in the skincare industy. I connect with you so deeply when you talk about makeup playtime. We both find joy in applying make up , appreciate thoughtfulness and details (like a Besseme lipstick or a magnetic closure!) And truly enjoy the the entire makeup experience. 1. Thoroughness when reviewing products. I trust you to test foundations with various moisturizers, primers, and powders. I trust you not to give me a useless first impressions or a verdict after one day. 2. Professionalism in video content and quality. You balance personalism with professionalism exceptionally well. I enjoy seeing short clips of your daughters, coffee sipping, or if you are under the weather. However, I have never had to sit through a 4 minute intro filled with excuses and nonsense. 3. Application to real life. Your style and priorities match my style and priorities. 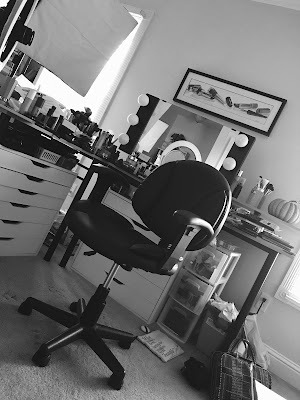 Our ideas of dramatic looks, natural , easy, and affordable mirror each other. I can recreate your looks for work, date night, and other events in between. With this being said, I would love to see these types of videos in the future. 1.Beauty chats while you're getting ready. We love getting ready with you. Focus the conversation on beauty news observations and thoughts rather than your personal life. 2. 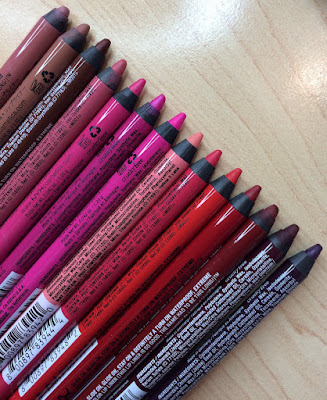 Very specific colored looks, possibly at different price points ex. Lilac eyes, mauve eyes, steely taupey purpley shimmer eye look. This could be very similar to your winter pink video. 3. Product comparisons. I adore your holiday palette reviews especially when you compare them because it determines my purchases. I can never get enough of these type videos. I hope my thoughts are helpful. Emily, you have been such an influence on my makeup journey and I can never thank you enough for your work. I send you and your beautiful family love and positive energy! facetime for Pc: The human race is known to be greedy and wanting everything that the other person has. This era is the era of technology. Everything that we see is modernizing. Great guide i would say. Hi Emily! I love reading your random middle-of-the-night thoughts, thanks for sharing! I had never watched your vlog channel, and I've been going back and watching an embarrassing number of those videos...I'd love to see you delve back into that channel with mommy/everyday life stuff! But of course I understand that the vlog channel requires going into your personal life more, and maybe that's just not your focus at this time. A couple of series I've loved on your main channel were Easy Eye Week, Beauty Chat, and Makeup Playtime. I love chatty videos! I've really missed your blog posts! Could you maybe do them on a weekly basis? I was in total despair when I found Dr. Todd. My life was going terrible and I didn't know if I was coming or going. I had just gone through a rough divorce, wasn't making enough money to sustain me and my children, and my 17 year old son had just gone to jail for the first time. When I talked to him, I immediately found a sense of peace. He was very honest with me and I could feel that. He also told me that everything would be okay. After my work began, things began to change. My bills were all caught up, the relationship I was in became much stronger, I was never FLAT broke, and my son was released from jail earlier than we expected!! I also completely got over the failed marriage and began to move on. And, received a better position at my job which will cause an $800 per month increase!! I felt completely comfortable with the work that was being done because I was always encouraged by Dr. Todd. manifestspellcast@gmail. com is the BEST!!!! GREATMOTHEROFSOLUTIONTEMPLE@YAHOO.COM AND YOU CAN ALSO CONTACT HER ON WHATSAPP WITH HER NUMBER: +2348078359876 SHE ALSO HAS 2 BLOGS WHICH YOU CAN ALSO USE TO REACH HER. THESE ARE THE BLOGS BELOW. YOU CAN CHECK OUT THE BLOGS TO SEE HER WORK. دین یکی از مهم ترین رکن های جامعه می باشد و مردم بالی نیز از این ویژگی پیروی می کنند و درست به همین دلیل معابدی را می توانید در این جزیره مشاهده کنید که نشان دهنده تاریخ، فرهنگ و هنر این سرزمین می باشد. همین امر به سادگی می تواند برای علاقه مندان به هنر و تاریخ سرزمین ها دلیل برای استفاده از تور نوروزی بالی باشد که از دو معبد اصلی این سرزمین بازدید کنید. این معبد بر خلاف معبد قبلی دارای فضایی بسیار متفاوت می باشد که بر فراز صخره ها واقع شده است که منظره ای بی نظیر از فضای رو بروی خود به شما داده است. مشاهده غروب خورشید و امواج خروشان اقیانوسی پیشنهاد ما برای تور نوروزی 97 در معبد می باشد که باز هم در نوع خود بی نظیر و خاص می باشد. علاوه بر تمامی این موارد معبد جایگاهی بسیار مقدس برای بومیان این سرزمین دارد و همین دلیل برای استفاده از برترین موارد معماری دینی و تاریخی در آن بوده است. یکی از زیباترین جاذبه های گردشگری سنگاپور که چشم گردشگران را محسور خود کرده است، باغ زیبایی است به مساحت حدود 100 هکتار که درخت های خارق العاده و مجسمه های بی نظیری را در دل خود جای داده است. شما می توانید ساعت ها از دیدن این باغ استوایی لذت ببرید.این باغ دارای ابردرخت هایی با ارتفاع 25 متر است که هر کدام یک باغ عمودی هستند. بازدید از این باغ رایگان می باشد ولی باید برای رفتن بر روی پل اسکای وی بلیت تهیه کنید. با تور سنگاپور نوروز 97 همراه شوید و نوروزی متفاوت تر از همیشه را برای خود رقم بزنید. این مزارع به صورت پله کانی طراحی شده است که باعث بازدهی بالاتر انها شده و مدیریت منابع را بسیار آسان نموده است. به همین دلیل که خاص ترین مزارع را در خود جای داده است به یکی از مهم ترین جاذبه های گردشگری بالی تبدیل شده است. مطمئنا با حضور در این معبد می توانید اطلاعات مفید زیادی در خصوص آیین بودای مردم این کشور کسب کنید. آژانس مسافرتی کاروانیک از اینکه میزبان شما در تور سنگاپور نوروز باشد، بسیار استقبال خواهد کرد. در میان سفرهای خارجی، کشورهای شرق آسیا به جهت برخورداری از آب و هوایی مناسب، جاذبه های تفریحی و گردشگری فوق العاده بی نظیر و البته سهولت در صادر کردن روادید بیش از کشورهای اروپایی یا آمریکایی مورد توجه ایرانیها قرار داشته اند. یکی از این کشورها سنگاپور است که قصد داریم شما را جهت سفر به سنگاپور در نوروز ۹۷ در مقاله امروز آشنا کنیم؛ مطمئنا سفر به کشورهایی نظیر سنگاپور، مالزی یا اندونزی آن هم در ایام نوروز برای شما و سایر خانواده ای ایرانی بسیار لذت بخش خواهد بود. یکی از زیباترین جاذبه های گردشگری سنگاپور که چشم گردشگران را محسور خود کرده است، باغ زیبایی است به مساحت حدود ۱۰۰ هکتار که درخت های خارق العاده و مجسمه های بی نظیری را در دل خود جای داده است. شما می توانید ساعت ها از دیدن این باغ استوایی لذت ببرید.این باغ دارای ابردرخت هایی با ارتفاع ۲۵ متر است که هر کدام یک باغ عمودی هستند. بازدید از این باغ رایگان می باشد ولی باید برای رفتن بر روی پل اسکای وی بلیت تهیه کنید. زندگی و تفریحات شبانه در اسکله کلارک باعث شهرت آن شده است. نورهای بسیار زیادی از این منطقه ساطع می شود که چشم عابران را به خود خیره می کند. مرکز تجارت سنگاپور در همین اسکله واقع شده است و امروز به مکانی پر از رستوران ها، کافه ها و مراکز خرید و تفرجگاه های مختلف برای بسیاری از اهالی سنگاپور و جهانگردان بدل گردیده است. با تور سنگاپور نوروز ۹۷ همراه شوید و نوروزی متفاوت تر از همیشه را برای خود رقم بزنید. از دیگر مراکز خرید سنگاپور می توان به فروشگاه های داخل فرودگاه اشاره کرد. این فروشگاه ها به خاطر اینکه در فرودگاه قرار دارد و مالیات به آنها تعلق نمی گیرد نسبت به مراکز خرید دیگر با قیمت کمتری به فروش می رسد بنابراین در میان گردشگران طرفداران زیادتری دارد. در پایان باید به این نکته هم اشاره کنیم که اگر قصد دارید سنگاپور را به عنوان مقصد سفر خود انتخاب کنید لازم است نکاتی را درباره این کشور آسیایی بدانید. نکته اول اینکه نگران برقراری ارتباط با مردم سنگاپور، فروشنده ها، مسئولان هتل ها و نباشید زیرا اگرچه سنگاپور کشور آسیایی است اما اکثر مردم آن به زبان انگلیسی صحبت می کنند. امیدواریم نوروز ۹۷ بی نقص و البته فراموش نشدنیای را به همراه خانواده خود در سنگاپور سپری کنید. حتما شما نیز خودتان را برای سفری جذاب در نوروز 97 آماده کرده اید؛ بلیط سفر خود را با هواپیما، قطار یا حتی اتوبوس خریداری کرده اید و شاید هتل مورد نظرتان را نیز رزرو کرده باشید. قطار یا اتوبوس؛ سفری جذاب در نوروز را می توانند برای شما رقم بزنند. اما با توجه به نزدیک شدن به ایام نوروز پیدا کردن هتل های خالی و خرید بلیط کمی سخت بنظر می رسد خصوصا اگر بخواهید حضورا اقدام به این کار انجام دهید! امروزه با ظهور دنیای دیجیتال کسب و کارهای بسیار بر محوریت حل اینگونه مسائل و رفع نیازهای بوجود آمده است. حتی دیگر لازم نیست به آژانس های مسافرتی برای رزرو بلیط مراجعه کنید، تنها با فشردن چند کلیک می توانید به آسانی زمان پرواز هواپیما و حرکت قطار را مشاهده کنید و به و یا هواپیما خود اقدام کنید. بلیط هواپیما یا خرید بلیط اتوبوس اقدام کنید. برنامه سفر خود را به آسانی بچینید و از بودن در کنار خانواده لذت ببرید،دیگر زمان تغییر است و باید از کارهایی که می تواند وقت گران بها شما را هدر دهد باید جلوگیری کنید. تورآلماتی از جمله تور های مسافرتی است که خاطراتی فراموش نشدنی را برای شما به همراه خواهد داشت. آلماتی که در بخش مرکزی قاره اوراسیا و جنوب شرقی قزاقستان واقع شده تا نوزده سال پیش پایتخت کشور قزاقستان بود. از دیگر جاذبه های گردشگری آلماتی که در سفر به قزاقستان می توانید از آنها دیدن کنید، می توان به مرکز خرید مگا سنتر آلماتی که مساحتی بیش از هشتادهزار متر دارد و یا جاذبه های تاریخی و مدرن شهری این شهر اشاره کرد. بد نیست به این موضوع هم اشاره کنیم که موسیقی، هنر چشم نواز قزاقی و همچنین غذاهای محلی لذیذ این کشور همیشه برای گردشگران تورهای خارجی جذاب بوده اند. بی شک تجربه تور بهاری در قزاقستان که به سبب موقعیت جغرافیایی ویژهای که دارد، از آب و هوای بسیار مطبوعی در این فصل برخوردار است، برای شما خاطره انگیز خواهد شد. اگر از ما بپرسید، تور جذاب و جدید یعنی تور بهاری قزاقستان که امتحان آن حتما توصیه می شود. کم کم بوی فوتبال می رسد؛ بویی کاملا متفاوت... بوی جام جهانی می آید! انتظارها در حال به پایان رسیدن است و کل دنیا تا 50 روز دیگر مجددا پس از 4 سال می توانند شاهد هیجان انگیزترین رقابت های فوتبال در سراسر جهان باشند. بد نیست بدانید که شمار ایرانی هایی که از چند ماه پیش شروع به خرید تور جام جهانی روسیه کرده بودند، همچنان جریان داشته و هرچه به این رقابت ها نزدیک تر می شویم، روز به روز افزایش می یابد. در خلال روزهایی که تیم ایران بازی فوتبال با رقبای خود ندارد، به گردشگری در شهرهای روسیه بخصوص مسکو و سن پترزبورگ بپردازید مطمئنا شما هم می توانید لذت فوتبال با تور جام جهانی ۲۰۱۸ را از نردیک بچشید!